With the single 'Kids in America' the English singer Kim Wilde has made a name for herself in a short time. The record was a big hit and the successor, the less strong 'Chequered Love' is also doing well in several charts. 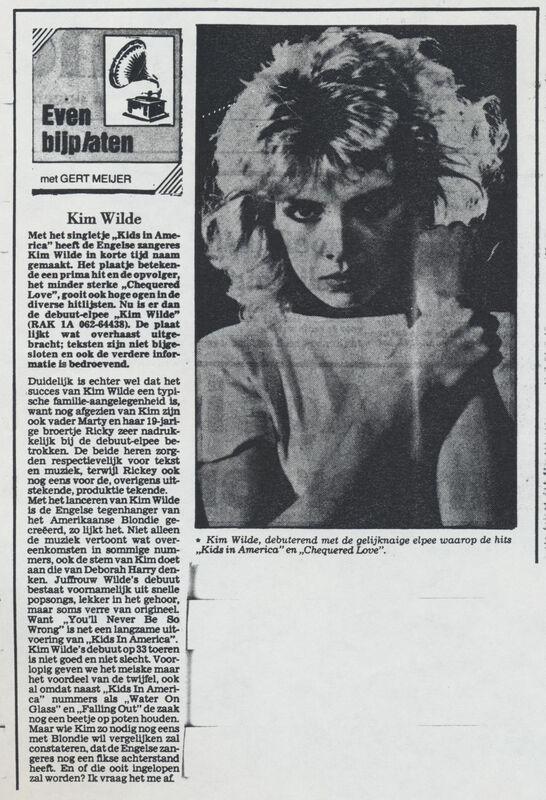 Now there is the debut album 'Kim Wilde' (RAK 1A062-64438). The record seems to have been released in a rush; lyrics are not enclosed and the rest of the information is also lacking. It is however clear that the success of Kim Wilde is a typical family business, because besides Kim her father Marty and her 19 year old brother Ricky are expressly involved in the debut album. Both gentlemen took care of lyrics and music respectively, while Ricky also signed for the, outstanding, production. With the launch of Kim Wilde the British counterpart of American Blondie has been created, it seems. It's not just the music that seems to be the same in some songs, but the voice of Kim reminds us of Kim as well. Miss Wilde's debut consists mainly of fast pop songs, nice to hear, but sometimes not very original. Because 'You'll never be so wrong' is like a slow version of 'Kids in America'. Kim Wilde's debut on 33 rpm is not good and not bad. We will give the girl the benefit of the doubt for now, also because besides 'Kids in America' songs like 'Water on glass' and 'Falling out' keep things on their feet. But whoever wants to compare Kim with Blondie will see that the English singer still has some catching up to do. And will she ever? I wonder.